This map of Mars shows relative locations of three types of findings related to salt or frozen water, plus a new type of finding that may be related to both salt and water. Coloring of the map is coded to concentrations of shallow subsurface water ice found by the Gamma Ray Spectrometer - Neutron Spectrometer on NASA's Mars Odyssey orbiter. Blue, at high latitudes north and south, indicates higher concentrations of water ice (deduced from detection of hydrogen); orange designates lowest concentrations. Some hydrogen, possibly in the form of bound water, is close to the surface even at middle latitudes. The white squares in the northern hemisphere mark locations of small fresh impact craters that exposed water ice close to the surface and validated the neutron spectrometer data. Observations of these fresh craters were made by the Context Camera and the High Resolution Imaging Science Experiment camera on NASA's Mars Reconnaissance Orbiter. 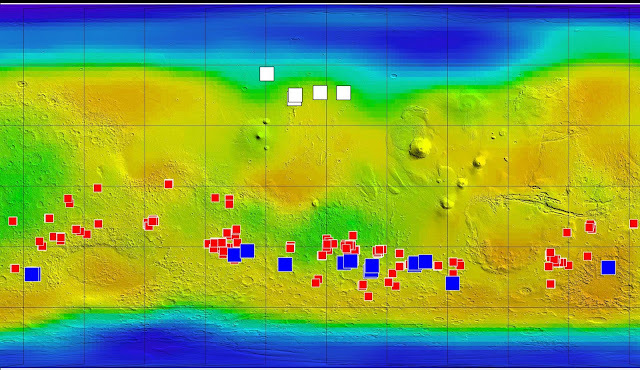 The red squares mark locations of putative deposits of chloride based on observations by the Thermal Emission Imaging System on Mars Odyssey. Such salt deposits could have resulted from evaporation of salty water. The blue squares mark locations of a type of feature reported in August 2011 based on sequences of observations by the High Resolution Imaging Science Experiment. The observations show relatively dark features appearing and incrementally growing down slopes during warm seasons. Researchers hypothesize that these features may result from action of briny water.